"City of One Hundred Spires"
State of Illinois Invitational Marching Band Champions: 2007, 2008. State of Illinois Invitational Marching Band Finalists: 2001, 2002, 2003, 2004, 2005, 2006, 2007, 2008, 2009, 2010, 2011, 2012, 2013, 2014, 2015. State of Illinois Invitational Marching Band Class 5A Champions: 2008, 2010. State of Illinois Invitational Marching Band Class 6A Champions: 2006, 2007. Bands of America Grand National Semifinalists: 2010, 2011. BOA Bowling Green, OH Regional Finalists: 2015. BOA Indianapolis, IN Regional Finalists: 2007, 2008, 2011, 2012. BOA Kettering, OH Regional Finalists: 2010. BOA Louisville, KY Regional Finalists: 2009, 2012. BOA Mason, Ohio Regional Finalists: 2011. BOA Toledo, Ohio Regional Finalists: 2001. BOA Ypsilanti, MI Regional Finalists: 2006, 2007. 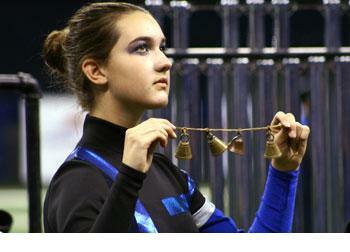 BOA Indianapolis, IN Class 3A Regional Champions: 2011. East opened in 2001 after spliting from the Lincoln-Way Community High School. Group background before 2001 is shared with the Lincoln-Way Marching Knights. Past Directors: Melissa Goff and Dan Valkema (2001-2002), Bert Johnson (2003-2007, head director 2005-2007, 2012-present) T. Clifton Smith (2008-2011). In 2008, Lincoln-Way East split to form Lincoln-Way North. In 2016, the Lincoln-Way bands will merge together to form the Lincoln-Way Marching Band.